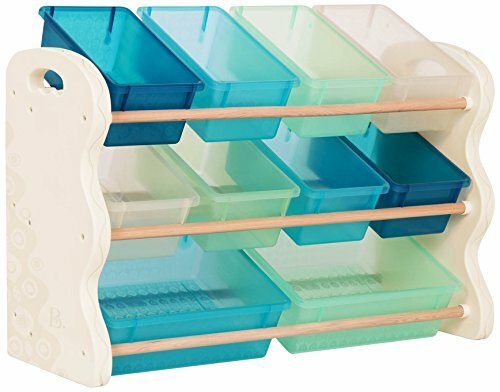 Tote-ally tidy storage for any room This organizer unit is just perfect. Tuck everything away at the end of the day with ten sortable bins for all your things. It’s sized perfectly for toddlers or kids a little older. The TEN stackable totes come in a range of translucent dreamy colors like Deep Blue, Mint, Sea and Light Ivory. Move the unit easily with the handy handles. Books and plushies, toys or squishies, this storage unit keeps everything neat and tidy. BINS COME IN TWO DIFFERENT SIZES: Perfect to hold all your big stuff, but also your itty bitty things. SLEEK MODERN DESIGN: Gorgeous Mint color with funky patterns. SOLID WOOD DOWELS: Real wood adds style and sturdiness. SUPER EASY ASSEMBLY: Hexagon Key tool is included. ADD EVEN MORE PIZAZZ: Coordinates perfectly with other B. spaces furniture. TRUSTWORTHY - Battat is a family-owned company, established in 1897. B. POWERFUL - WE.org receives a portion of sales from every B. item purchased.